Samsung is preparing a slew of new foldable smartphones set to launch after the release of its so-called Galaxy X early next year. The South Korean company sees these pliable displays as the future for its handsets, since they enable it to squeeze larger tablet-sized OLEDs into devices small enough to carry around all-day. According to the latest patent filed by the company, Samsung envisions an upcoming handset that uses a magnetic hinge to allow the device to fold like a book. Like the Galaxy X oh-so briefly teased on-stage during the Samsung developer conference last month, the handset offers more screen real estate to watch videos, play games, and run applications side-by-side when the display is unfolded. The latest patents were published by the World Intellectual Property Office (WIPO) at the end of last month, when they were unearthed by technology blog LetsGoDigital, which has created some gloriously realised renders based on the dry legalises descriptions of the upcoming handset. 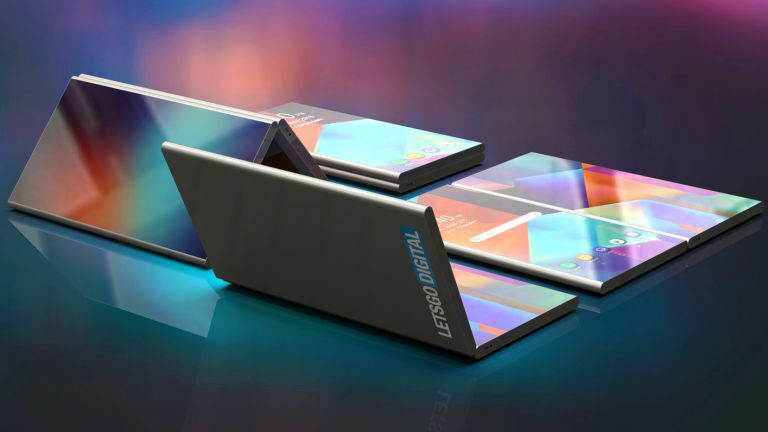 According to the patent, the folding smartphone will boast two separate housings, that each holds an edge-to-edge display. Fully unfolded, the handset has a tablet-sized display capable of running multiple apps side-by-side. The magnets in the hinge enable the screen to hold itself upright, so the two displays can be positioned at a 90º angle, like a laptop. One of the screens will then be used to display a QWERTY keyboard to enhance productivity. Information like time, notification indicators, battery and signal strength will be shown on the left-hand display, according to LetsGoDigital. The patent filed by Samsung describes the futuristic device as having two cameras. The primary shooter and LED flash are positioned on the front of the handset. Once unfolded, the camera will be positioned on the upper left-hand side of the gadget. Although it is not shown in the renders, the patent does describe the as-yet unannounced smartphone as sporting a 3.5mm audio port at the top or the bottom of the device. However, only time will tell whether this design decision will change after the launch of the Samsung Galaxy A8s later this month. The power button and the volume button are placed on the side of the first housing.